The Russian fighter-bomber flew over international waters close to NATO airspace. A Danish F-16 alongside a Russian Su-34 during identification. On Thursday, Jan 25, the Royal Danish Air Force F-16 fighter jets, presently deployed to Šiauliai Air Base, Lithuania, were launched to conduct their first intercept safeguarding NATO airspace in the Baltic region. In the morning of January 25, NATO radars picked up an air track that did not comply with international standard aviation rules as it was neither sending a transponder signal nor in radio contact with civilian air traffic control nor was a flight plan available. The track moved from mainland Russia to the Russian enclave of Kaliningrad over international waters near NATO airspace. Consequently, two Royal Danish Air Force F-16 interceptor jets were tasked to fly to the area to identify the track, a Russian fighter aircraft. 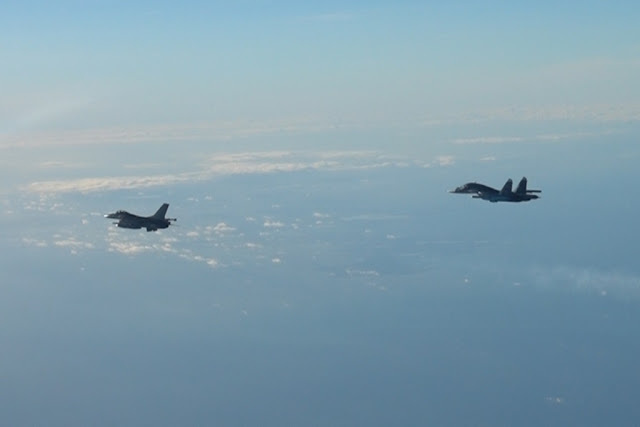 Upon successful completion of their mission the F-16s returned to Lithuania. Missions like this are a standard occurrence especially in the Baltic Sea region. NATO jets are on alert 24/7 to respond to similar incidents. When aircraft are flying with their transponders off, and when they are not in contact with civilian Air Traffic Control they cause a risk to other air traffic because they do not feature on civilian radar systems. This is when NATO launches one of their Quick Reaction Alert interceptor planes. The NATO jets fly close to the unidentified plane and their transponder signal is picked up by the air controllers allowing them to take measures to prevent mishaps with civilian airliners. While NATO Air Policing is conducted across all NATO Allies in Europe, the Baltic Air Policing mission is special because Estonia, Latvia and Lithuania do not have their own asset for this mission. When the three States joined NATO in 2004, Allies agreed to deploy their jets to the region on a rotational basis to ensure skies over the Baltic region are safeguard to the same standard as in the rest of Alliance.